The town of Tréguier (or Treguier) lies in the north of Brittany, in north-west France. It sits atop a hill overlooking a bay where the Rivers Jaudy and Guindy meet and culminate in a pretty estuary. 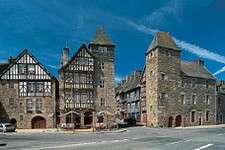 Tréguier is a popular holiday town as well as a lively and thriving centre of commerce and Breton traditions. The harbour, with its fishing and leisure craft, makes a colourful backdrop to the town, and the charm offensive doesn't end there, as in the old parts of town there are some beautifully preserved colombage (half-timbered) houses dating back to the 15th and 16th centuries. The other remarkable buildings in Tréguier are made from the local pink granite, and these rather grand and elegant houses date from the later years of the 17th and 18th centuries. The cathedral is another notable feature of Tréguier, and pilgrims come from far and wide to lay gifts (or bribes!) at the tomb of St Yves, patron saint of lawyers, who is buried there. The cathedral, dedicated to St Tugdual, is also architecturally stunning, and was built during the 14th and 15th centuries. Its cloisters, with 48 imposing arches, are awe inspiring and even if you do not usually get excited about visiting historic churches, you really should allow a little time to see this one, as it is a sight that will impress anyone! It is also interesting to note that there is a festival unique to Tréguier. This is the Festival of the Pardon of St Yves, when a procession of some 10,000 pilgrims, dressed as lawyers, parade through the town seeking pardons for their sins. The port and harbour are not only picturesque (what Breton port isn't? ), but also carry an excitement and buzz in the atmosphere that never fails to enliven and awake the senses. Smell the fresh seafood being prepared in the pretty waterfront restaurants, treat yourself to a delicious crêpe from one of the many crêperies, or simply order a coffee and sit and soak up the atmosphere. Watch as the boats come and go, the fishing boats leaving their treasures on the quayside for the buyers, the hoteliers and restaurant owners, and the pleasure and sporting craft proudly flaunting their rainbow colours on the blue waters. The town is not large, but it has all the usual facilities and amenities such as banks, schools, doctors and so on. There are lots of shops, including the quintessentially French boulangeries and patisseries, so you can indulge in that fresh baguette or croissant whenever the fancy takes you! Should you wish to enjoy the extra facilities provided by a larger town, the departmental capital of St Brieuc is close by, and is an interesting place to visit. There are lots of sporting opportunities in Tréguier, and many of these are, as expected, provided by the sea and the rivers. Sailing is a very popular pastime, and you don't have to travel far to get access to windsurfing, swimming, fishing and many other water related sports. There is a nine-hole golf course nearby, and horse riders, walkers and cyclists will all be able to enjoy their hobbies locally. Tennis and boules courts are, of course, legion! To get to Tréguier by air you should take a flight into Dinard Airport with either Air Aurigny or Ryanair. Travelling by ferry is another good choice as Brittany Ferries can get you to nearby St Malo with no fuss at all. Property close to the coast in Brittany has long been popular with both French and foreign buyers, so prices can tend to be high. However, this can be offset by the high rental value of property too, and the desirability of Tréguier as a holiday location. Do you know Tréguier better than we do? Do you have photos of Tréguier? Tréguier is located in north-west France, on the estuary of the Rivers Jaudy and Guindy. It lies in the north-west of the Côtes d'Amor department. Access: By air: Fly to Dinard with airlines Air Aurigny and Ryanair. By boat: The ferry port of St Malo is the nearest, served exclusively by Brittany Ferries. Economy: The economy is based on tourism, but also involves the industries of saw milling, boat building and flax stripping, and commercial interests in cloth, cereals and potatoes. Interesting fact: The cathedral, which houses the tomb of St Yves, patron saint of lawyers, is still a popular site for pilgrims who place gifts at the saint's tomb, hoping to obtain a pardon for their sins.